As much work as you put into planning your Georgia vacation, there's always the risk that something will go wrong. How can you be sure that your hotel will be as clean and comfortable as their website promised? What if you and you family are stuck in an uncomfortable space for a week or more during your trip? They say that you should always "expect the unexpected", but there is no reason that your vacation should not exceed your expectations. That's where our lush and affordable cabin rentals come into play. When you opt to stay in one of the Helen cabin rentals you can rest assured that you will have an incredible experience, get the most value for your dollar, and can expect nothing less than the absolute best vacation you've ever had. Luxurious Accommodations -It's unfortunate that images of musty conditions, uncomfortable beds, and horror movies come into people's minds when they think of cabins, because we provide guests with the ultimate in luxury and comfort. Instead of trying to live in tiny hotel room, sharing beds and one bathroom with your family, imagine spreading out in a multi-story, multi-bedroom cabin. There's plenty of space for everyone to relax and unwind in their own cozy beds with clean bedding provided for your comfort and convenience. You won't be living in the dark ages either, as our cabins feature free wireless internet, flat screen TVs, climate control, hot water, and more! You can request cabins that have game tables, porches or patios, barbecue grills, fire places, fire pits, Jacuzzi baths and more! And after a long day of exploring northern Georgia with your family and friends, you can come back to your cabin and enjoy a long, hot soak in your own private hot tub. The best part is that all of this comes with the standard price of the cabin rental - no added or hidden fees involved! Tons of Options - One of the greatest advantages of a mountain cabin vacation is that you have the power to choose your own dream accommodations. You never have to stare at a brick wall as your "scenic view" from your vacation rental again. When you stay in on of our luxury cabins, you will be able to customize your perfect view. 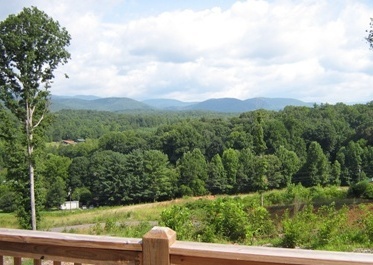 Would you like a seasonal view of the northern Georgia mountains, or do you prefer to enjoy panoramic views of the woods around your cabin? You can even select a cabin with your own private stream or a waterfall view. In addition to selecting the scenery you'd like to take in during your vacation, you'll also be able to pick where you would prefer your cabin to be located. For those who want to be right in the heart of the action, you can choose cabins in Helen or within a couple of miles. For groups that like the idea of privacy and seclusion, you can opt to stay in one of the cabins that are fifteen or twenty miles away from the downtown Alpine village of Helen. You'll be able to pick how many bedrooms you would like, how many stories you prefer your cabin to have, and we even have cabins that accommodate bikers or groups with pets! Total Privacy - When you are spending money on your vacation rental, you shouldn't have to worry about sharing the space with hundreds of other groups and families! Instead of listening to thundering ice machine outside your hotel room door, why not take in the sounds of a thundering waterfall? And instead of the cries of children in adjoining rooms, wouldn't it be nicer to hear the songs of Georgia birds? 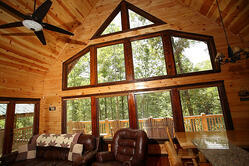 Cabins can provide you with all of the privacy that you deserve during your getaway excursion. You and your family can enjoy your own private meals in your cabin's fully equipped, modern kitchen, use your hot tub and game tables without having to share with anyone else, and you can even have some privacy from one another. When Mom & Dad can have their own room, you'll find that your vacation is a lot more pleasant, flexible, and fun! Are you ready to for a vacation that exceeds your expectations and creates lasting memories? 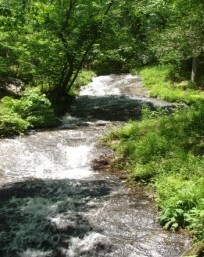 Book a visit to the cabins in the Georgia mountains today!